Ask fellow campers about "Gilbert Lake State Park" and nearby attractions. Like our previous visits to this park, our back-in site was easily large enough for our 34' coach and toad. We were there for 10 nights including the July 4th holiday, and the park was always quiet at night, with just occasional shouts from kids playing in the central meadow during the day. We were in one of the few with individual water service and 50 am service. This row sits a little higher than the rest of the Hilltop Loop, and the diagonal sites offer a good view down into the main part of the loop. As always here, the restrooms were quite clean, especially the individual family/handicapped restrooms we used. Dish eastern arc satellite reception from our site was tight but doable with our portable dish. The western arc and DirecTV sats were unreachable through the heavy tree cover in that direction. We didn't try over the air TV this time, but I expect the same Utica NBC repeater is still viewable with other networks on sub-channels. AT&T and Verizon cell signals were strong enough and fast enough for streaming using our cell booster/repeater. As others have mentioned, the roads in the park are a bit rough and in need of repaving, but easily negotiable given the low speed limits. The climb up to the Hilltop Loop is steep, but all sizes of RV's seem to manage it ok. Gilbert Lake is one of our favorite NY state parks, and we love taking our granddaughter, her husband, and our great granddaughter for an afternoon picnic and swimming at the lakeside beach. This park would be a 10 with on site sewers. We will definitely be back again! We camped at Gilbert Lake State Park in a Motorhome. There are plenty of stores and restaurants in nearby Oneonta, NY. Stayed July 2nd -July 6th. Was greeted by very friendly staff. Park office sells wood, ice and odds and ends. We stayed in site #106, which was very level and spacious with plenty of space between sites. This site did not have any hookups but was close to two water spigots. Bathroom/showers were clean. Garbage dumpsters are near entrance/exit and you will have to drive your vehicle to throw out your garbage. The roads within the SP are fine but when you enter the camping area the roads have a few small potholes and the site numbers which are painted on the asphalt are worn out pretty bad. I was pulling my 5th wheel which isn't the largest out there and there were some low branches to try and avoid getting to my site but it wasn't horrible. Nice beach with life guards on duty and picnic areas. I would have no problem returning to Gilbert Lake SP. We camped at Gilbert Lake State Park in a Fifth Wheel. This was our third visit to Gilbert Lake SP, and like our other stays, this one was enjoyable and remarkably quiet given the full park and 4th of July holiday. NYS parks do not allow fireworks, so that helps. Our site (#53) was only 30 amp with no water hookup, so we had to be a bit more watchful as to what we turned on at the same time and how much water we used. We had no problem receiving the Dish network eastern arc satellite signals on this site, and our Verizon and AT&T phones and hotspots all work well with some help from our cell booster amplifier. The restrooms were a two minute walk from our site, and the private handicapped bathroom/shower my wife and I used was quite roomy and very clean. As other have said, be patient waiting for the water to heat up though. I learned quickly to turn it on as soon as we entered so it would be getting hot by the time we were ready to use it. This site was a little closer to the neighbors than we prefer, but wasn't bad over all. The access road to the Hilltop section where we were is fairly steep for part of the distance, but larger motorhomes than our 34' coach and a number of larger TT's and 5'vers had made the trip apparently without much difficulty. Gilbert Lake SP is close enough to Oneonta, NY for an easy trip to many stores and restaurants. We camped at Gilbert Lake State Park in a Motorhome. Oneonta is the home of Brooks BBQ, and well worth the usual wait to get seated in their dining room. Check in was very slow, internet connection? We were in Hilltop section. Steep hill up but nice area on the top. We were in a back in #1. Spacious and it did have a water connection. Agree with comments about low branches and tight turn into the sewer dump site. The lake is beautiful, the beach had lifeguards. Originally developed by the CCC, still has some of original buildings. Good trails to hike. We camped at Gilbert Lake State Park in a Fifth Wheel. Baseball hall of fame about half hour away in Cooperstown. A must visit. We paid $23/night plus $5/night non-NY resident fee plus $9 online booking fee. No tax. This park does NOT offer water hook-up's at ANY site per se. There are numerous water spigots. Many spigots can be reached from individual campsites but you cannot keep your hose connected. Check-in was efficient and friendly. If you have a pet, you must produce a rabies certification. There is zero cell or wifi at the park office so be sure to print it before you arrive. We stayed our first night in Hilltop site #3. Given lots of recent rain, it was a mix of gravel and mushy grass/mud. We couldn't get level and couldn't get DirecTV. Note - between #2 and #3, there is a little stone building housing utilities. It's cute and well-done so I don't feel it takes away from either site. Between #3 and #4 is a service road. It's not used much but it's not terribly attractive. The next morning we moved to Hilltop site #32. It was gravel with slightly less mush. We were able to level and obtain DirecTV. Once the sun came out and things dried a bit, we discovered what a huge, beautiful park this is. The lake is very pretty. The ADA restrooms were fabulous. Note - the water needs to run a long while before it gets hot so be patient. The 50amp hook-up worked well at both sites. Our Verizon cell and Verizon Mifi both worked on the hilltop. You need to drive your trash to the dumpster near the entrance. The dump station is (literally) miles away and requires a very tight turn to access. The public roads on the way in and the interior park roads need tree trimming. We had mechanical issues during our stay. The park staff was super accommodating which we greatly appreciated. Bottom line - I am forced to conclude it's not truly big rig friendly. If you're experienced and determined, you can certainly do it but it's gonna stretch your capabilities especially if it's wet and muddy. We'd love to return one day but, sadly, I don't think we'd attempt it again in our 40' rig. We camped at Gilbert Lake State Park in a Motorhome. Cooperstown is about 23 miles away via two lane country roads. There is no traffic and the scenery is pretty. The Baseball Hall of Fame is a must. You can leave and re-enter on the same day if you want to take a break for lunch. The town itself is quaint with a beautiful lake and cute downtown with souvenir shops and restaurants. We enjoyed coffee and a big, delicious oatmeal raisin cookie on the lovely shaded garden patio at Stagecoach Coffee. Our site was in the "Hilltop" section, and we had one of the few sites with individual water service. Our 50 amp electric was solid and reliable. The park is very clean and well maintained, with workers regularly visiting the restrooms and restocking as needed. Our site was reasonably large, and could easily accommodate the largest RV's. Some may find the steep road grade leading to this section challenging though. The tree cover at our site made satellite dish aiming difficult, but we were able to "see" the Dish eastern arc satellites ok. Verizon cell service was weak, but our on board cell amplifier/repeater handled it well. OTA TV is limited, but we did find a fairly strong signal from a Utica station that carries NBC on their primary channel, and CBS on a secondary channel. Gilbert Lake is somewhat of a secret, and the park was very lightly occupied while we were there during the week. I expect it does get busier on the weekends. All in all, this is a nice park to visit to just relax, and a number of attractions are nearby, such as the Baseball Hall of Fame in nearby Cooperstown. We will return here fairly often since our granddaughter and great granddaughter live nearby. We camped at Gilbert Lake State Park in a Motorhome. Oneonta is only about 20 minutes away, with all the usual big bx stores, and plenty of restaurant choices. Brooks BBQ is one of our favorites. We were in Hill Top loop in a spacious, level, well shaded site, with gravel & grass, with water & 30A electric, grounds were clean & well maintained. Bathrooms & showers were clean & always well stocked. The only strange thing I found about this campground, was the fact that this is the Only CG we've ever been in that had NO trash cans, anywhere in the loop, however the dumpsters/recycle bins were centrally located. This is a very quiet, slightly out of the way campground, there are numerous restaurants & places to shop in Oneonta, about 14 mi away. There is a nice lake with fishing & swimming, a beach & hiking trails. There are also numerous cabins for rent for those without an RV. While there is no sewer, there is a dump station. If we ever find ourselves in the area again, we will certainly stay here again. We camped at Gilbert Lake State Park in a Motorhome. We stayed in an electric camp site, which meant full sun, but there was always a breeze. We were close to the restrooms. Restrooms were better than some RV parks we have seen, always clean. Private showers (two men, two women, two handicapped) Weird, never had to wait though? We will return. We camped at Gilbert Lake State Park in a Travel Trailer. Kids loved the Norwich auto museum, Cooperstown, and Howes caverns. We stayed in a tent. I had mixed feelings after reviews were both good & bad. It was really nice. We stayed at site 111 in Deer Run. 113 Also seemed like a good site. There was some privacy and lots of space between our sites. The restrooms/showers were clean & centrally located. They had hot water & I didn't mind that I had to push the button to keep the water going. The dish cleaning area was clean & had hot water. The beach was clean & very large. The water in the swimming area was clean which was wonderful and the swimming area is large. The concession stand was nice w/ tables. I locked my keys in the car & there is a park police station on site. He was so helpful & got my keys out. He actually found a spot w/ cell service & came back to let me know the weather. They have activities for the kids, movies, sand castle contest. A really great safe clean campground. Only cons--the wood is wet so it doesn't burn real bright and some of the roads need to have pot holes fixed. We will go back!! Great Place. We camped at Gilbert Lake State Park in a Tent. The entry road to this park could use some maintenance, but it is passable within the posted speed limits. The park itself is quite nice, with a variety of hiking trails, ball fields, swimming, etc. The electric-only campsites where we were, were spacious and easy to back in to since they were laid out at a 45 degree angle to the road. Verizon voice and 4G data reception was okay at about 3 bars, and satellite reception from the Dish Network eastern arc was good with a portable antenna that allowed proper pointing past the trees. Our roof dish did not work here. There were lots of kids around, but everyone we encountered was polite and friendly. We will stay here again when time permits. We camped at Gilbert Lake State Park in a Motorhome. Gilbert Lake State Park (GLSP) is one of our favorite campgrounds; we camp here every year in May to open our summer camping season. This review addresses the Hilltop area. GLSP features cabins and additional, non-electric sites elsewhere on the grounds. The Hilltop area is in the process of being renovated; they are reworking the sites to make them more RV-friendly, which will reduce the number of locations on the Hilltop, but will add 30A electrical service at all sites (up from the dozen or so sites that currently have it). Bathroom facilities on the Hilltop have been updated, and include an outdoor sink for dishes as well as a washer and dryer for laundry. 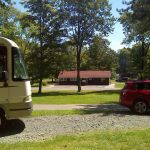 GLSP has a waterfront with swimming, boat rentals, and a concession stand/camp store, in addition to some very nice picnic pavilions and hiking trails. We camped at Gilbert Lake State Park in a Travel Trailer. This NY state park is fairly easy to get to off of Interstate 88. When we stayed there the only camping area open was the Hilltop unit, so I can only comment on that area. Also, there had been a lot of rain and the rain continued while we were there so we were not able to check out the area extensively. There are a very limited number of electric sites and many of them are too small or sloped to be usable for most camping units. Many of the sites have no gravel, just on the grass. We are only 27 feet long, so had no problem in getting into our site, but I would not really call the Hilltop camping area big rig friendly. The power pedestals are shared by two sites, so will be very difficult to access from some sites. It will take a very long cord. The dump station is quite a ways from the Hilltop camp unit. The campground is pleasant, with some sites in the woods and some out in the open. We were able to get satellite from out site and our Verizon phone and internet worked well. It was nice and quite at night (only about 10 other spaces occupied) and fairly dark, which we like. There is a nice warm glow from a cola machine, which does not really add to the ambiance. We did not use the restrooms or showers, but did look and they seem clean. Overall everything looked a bit tired and rundown. Like many of our state parks it could use some help. We would stay here again as an overnight or two but would not go out of our way to visit this park. We camped at Gilbert Lake State Park in a Motorhome. We camped at an electric site in hilltop area. Had a nice large shaded site. Many sites in this area in open field. Has good clean restrooms and shower facilities. A little far from Cooperstown, which is why we stayed here. We camped at Gilbert Lake State Park in a Tent Trailer. This is a beautiful state park that has not been discovered. The lake is pristine with boat rentals available. There are no planned activities for children or adults- just mother nature at her best! We camped at Gilbert Lake State Park in a Travel Trailer. Are you affiliated with Gilbert Lake State Park ?